DEAR MAYO CLINIC: My mother and my sister were treated for uterine fibroids in their late 30s. I just turned 35, and I’m starting to worry that I’ll get them, too. Am I at risk for fibroids because I have a family history of them? Are there other things that raise my risk? What symptoms should I watch for? ANSWER: Heredity can play a role in your risk for developing uterine fibroids. Your age, race, when you started having periods and a number of other factors also can affect your likelihood of getting them. 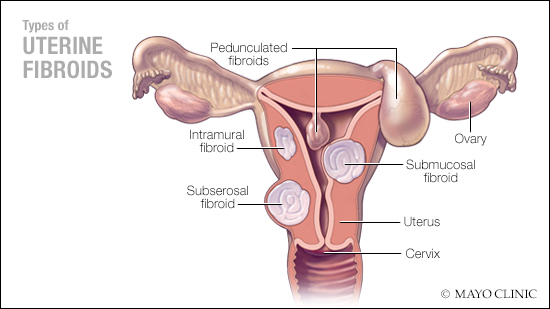 Uterine fibroids don’t always cause symptoms. But when they do, heavy menstrual bleeding and cramping are the most common. Family history is one risk factor for uterine fibroids. Women like you, whose mother or sister had fibroids, are at increased risk for developing them, too. Age also makes a difference. Uterine fibroids don’t occur in girls before puberty, nor do they develop in women after they have gone through menopause. These fibroids most often are diagnosed in women in their 30s and 40s. As you consider your risk of developing uterine fibroids, keep in mind that these fibroids often don’t cause any symptoms. They may be found during a test being done for another reason, such as a pelvic exam or a prenatal ultrasound. In these cases, no treatment is needed. Fibroids are not cancerous, and they usually grow slowly. Some do not grow at all. Living With Cancer: Do you need a 3D mammogram?